Fae Dibbert - Worth paying a bit more for the great quality of the product, and was very right to trust UK Diesel Parts, incredible service. 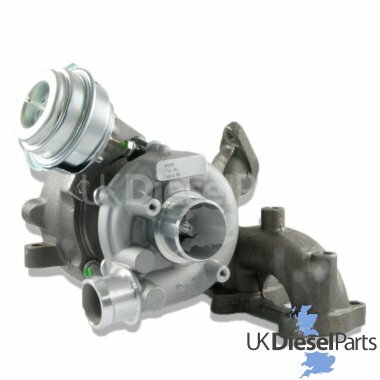 Why Buy A Turbocharger From UK DIESEL PARTS? Once you have received your Turbocharger(s) the item(s) will not need calibrating or adapting to work in replacement of your existing unit, Simply fit the new Turbocharger by following the manufacturers guide and drive away. UK Diesel Parts does recommend having this unit fitted by a qualified vehicle technician. Why Choose UK Diesel Parts? We are UK Diesel Parts Ltd, specialist online distributor of new aftermarket Diesel and Petrol car parts. The team has over 15 years of industry experience in ecommerce and 20 years in the Diesel Fuel Injection automotive industry. Our aim is to make quality replacement automotive parts available to all customers at trade prices. We utilize the contacts made during our time in the automotive industry to source, buy and import products from worldwide. We buy quality automotive parts backed by manufacturers guarantees, this ensures all our products can be purchased with complete customer confidence. We currently hold stocks of original manufacturer and best quality replacement parts for most Diesel Fuel Injection Systems including Bosch, CAV Lucas, Delphi, VDO Siemens, Zexel and Denso. We pride ourselves on customer care and technical support. We have up to date information readily available for most problems encountered with Diesel Systems. Do You Think Your Turbocharger Needs Replacing? We at UK Diesel Parts pride ourselves on not just customer care and delivery speed, but knowledge gained over the 20 years we have been in the automotive industry. Free next day delivery to mainland UK! We stock a vast range of Diesel & Petrol car parts at our premises, in stock orders before 3PM Monday-Thursday will be shipped the same day for next day delivery. Orders placed on Friday will be shipped for delivery the following Monday. Fae Dibbert Worth paying a bit more for the great quality of the product, and was very right to trust UK Diesel Parts, incredible service. Here at UK diesel Parts we offer a number of delivery services, please refer to the appropriate section for further information. For orders placed after 2pm, please add 1 working day to your delivery date. No deliveries will be made on Weekends or Bank / Public Holidays. We are now able to offer flat rate delivery charges to most European Countries. Services to Italy, Norway & Switzerland will include import duty at the local rate. No deliveries will be made on Weekends or Bank/ Public Holidays. Your postage should be automatically calculated by our website and the prices displayed in the shopping cart before you purchase. No deliveries can be made on Bank / Public Holidays. Any deliveries scheduled to arrive on a Bank / Public Holiday will be delivered the following working day. In addition, our warehouse is closed on Bank / Public Holidays so orders placed on a Bank / Public Holiday will not be despatched until the following working day. If products are displayed as being 'in stock', it means we have good stock levels at our Mail Order Warehouse for immediate dispatch, in our normal delivery timescales. Products displayed as being 'Out of Stock' are normally held but are temporarily Out of Stock. Stock is due in from our supplier but we do not have an estimated date of arrival.